Manchester United are set to take on Arsenal in the Premier League game on Saturday, 02 December 2017 at the Emirates in what should be a massive game in the title race. If United drop points against Arsenal and City win their game against West Ham on sunday its pretty much curtains for the title race. That makes it a pivotal Premier League game where United must win against a very solid Arsenal side who are on a 12 game winning run at the Emirates. Match will be an evening kickoff starting at 17:30 uk time and BT Sports has the live coverage of this game in the UK. There is alot more to this game than usual Arsenal United rivalry. Over the last few years United has dominated Arsenal even after Sir Alex Fergusen and now with Jose Mourinho in charge there is more spice to it. In last two seasons Arsenal have defeated Manchester United at the emirates twice and they look in pretty good shape going into the massive weekend. United on the other hand have all their key players back in the reckoning and it will be interesting to see who starts for United upfront with Lukaku, Ibrahimovic, Martial, Rashford and Mkhitaryan fighting for three positions. Last time these two meet was back in May 2017 when Arsenal ran out comfortable 2-0 winners thanks to goals from Welbeck and Granit Xhaka against a very under strength Manchester United side. 54′ 1 – 0 Granit Xhaka scored a lucky goal when his heavily deflected shot scooped over De Gea in the back of the net. 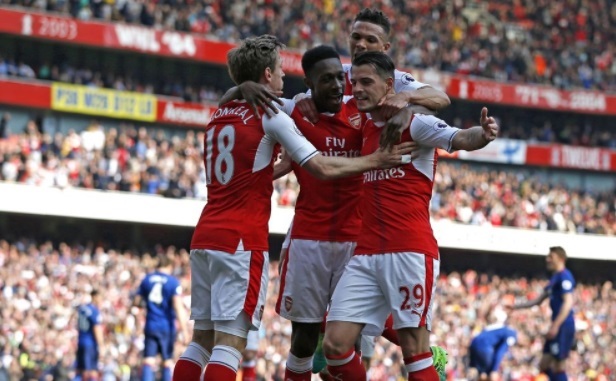 57′ 2 – 0 Danny Welbeck scored from close range to make it 2-0 minutes later and pretty much ended the contest. Last time these two meet was back in november 2016 when Arsenal came from a goal down to draw level 1-1 thanks to Olivier Giroud goal in 89th minute of the game. 45′ [ Half Time Report ] United dominated the first half and looked the only team who could have scored. United were harshly denied a clear penalty with Monreal brought down Valencia inside the box. While Petre Cech made couple of good saves to keep United at bay. 68′ 1 – 0 Juan Mata scores midway through second half to put United 1-0 in lead as they finally broke the deadline after putting Arsenal under massive pressure. 89′ 1 – 1 Olivier Giroud scores late in second half to steal a point in otherwise terrible performance from Arsenal. Arsenal vs Man Utd Preview & Team News United are coming into this game on the back of a impressive 3-1 win over Swansea and a win will not only put them right back into the title race but also restore the confidence. However its remain to be seen how United will lineup as Mourinho might go with a cautious approach and that might hand the initiative to Arsenal. Gunners on the other hand were held to a 1-1 draw at home against north london rivals Tottenham and they will be keen to get three points in this important fixture. This is how I expect both teams to lineup on Saturda. confirmed team news and starting lineups will be available couple of hours before the kickoff. Predictions: Jose Mourinho is under pressure and there is certain unrest in the squad but this game give United and oppertunity to put themselves back in the title race or at least get into the top 4 places. However with Ibrahimovic suspended Marcus Rashford might start upfront with Martial and Rooney playing in attacking roles alongside Mata. You can not write script for a premier league game this season, 18 year old Marcus Rashford started against hot favourites Arsenal and scored two goals within three minutes to put United 2-0 up but a goal from former United player Danny Welbeck made it 2-1 as the teams went into the break game pretty much there to be won. We will have the match highlights and goals video right here on this page. United started slow in second half but took control of the game as the game move into later stages. Ander Herrera scored United’s third with a deflected shot from just outside the box and looked to have won the game for United. 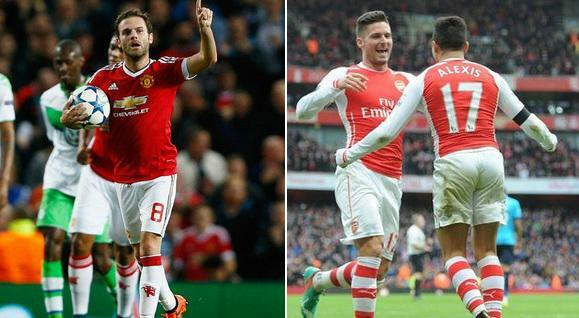 Arsenal however had different ideas as the scored again to get within a goal of united with 20 minutes to play for. Louis Van Gaal made couple of changes towards the end to make sure United are able to defend their narrow 1 goal lead which they did it without many scares. There was no clear penalty! It would have been a very soft and harsh pen if the ref had gone that way! No actual contact except for a very light touch across his abdomen with an outstretched arm which in no way brought him down! Daft to say otherwise really! ALEX SANCHES IS LIFE FOR ME!!! 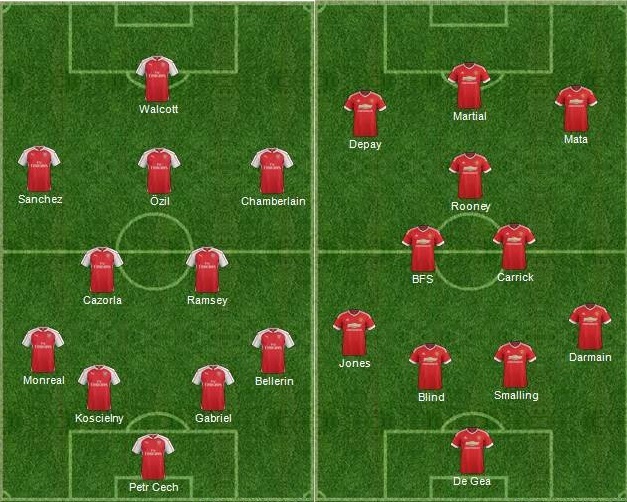 what a F@(king boring park the bus and counter attack team Utd are.